Update: Bill Council - a "lawyer's lawyer"
Bill Council, flanked by Art Peterson (left) and former Gov. 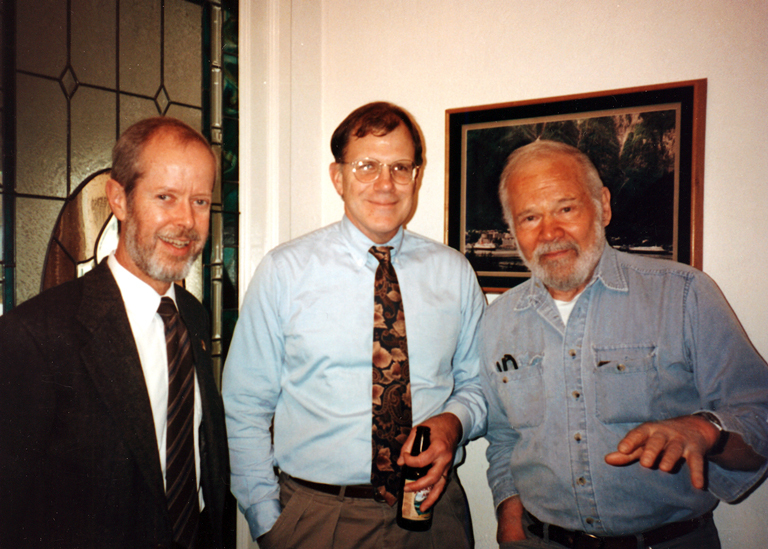 Jay Hammond (right), at a fundraiser for Alaska Legal Services in the mid-1990s. Photo courtesy Vance Sanders. Former Juneau resident and attorney Bill Council has died. Council passed away Sunday in Anchorage at the age of 69. He had been struggling with Parkinson’s disease. He is survived by his wife Fran Ulmer and two children, Amy and Louis. Council was born and raised in North Carolina and got his law degree from University of North Carolina Law School at Chapel Hill in 1969. He practiced law in New York City before taking a job as an assistant district attorney for the state of Alaska in 1971. He was a public defender in Ketchikan then moved to Juneau in 1975 to work in the civil litigation section of the Alaska Attorney General’s office. He was the state’s chief civil litigator during the Hammond Administration. In 1980, Council started his own law firm and for the next 25 years practiced with other Juneau lawyers, including Walter “Bud” Carpeneti, Vance Sanders, David Crosby and others. Sanders describes Council as a “lawyer’s lawyer” and a mentor to many in Alaska’s legal community. https://s3-us-west-2.amazonaws.com/ktoo/2013/09/Bill-Council.mp3Council was on the Alaska Judicial Council as well as local boards. He was an avid tennis player and boater. Council and Ulmer moved to Anchorage when she was named director of the Institute of Social and Economic Research in 2004. Ulmer also served as Juneau mayor, represented the capital city in the Alaska Legislature, was lieutenant governor in the Knowles’ administration, and is currently chair of the U.S. Arctic Research Commission.